Home > Comet Clutches and Parts > Comet 302610C. Comet Industries 780 Series Drive Unit. 1" Bore. > Comet 300821C Drive Clutch (Primary). Comet Industries 780 Series > Comet 300373A - 780 Series Retaining Ring > Comet Industries GP-730A Spray Lubricant - Single (204097A) > Comet 209418A. Comet Industries 44 MAGNUM Series Drive Clutch. 1" Bore. 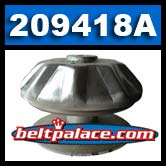 209418-A MANCO-Comet Industries 44 Series Centrifugal Clutch. Comet 44 Series Drive: 1" Bore, 1/4” KEY, for Go Karts, Golf Cars, Mini-Bikes, Snowmobiles, UTV’s. Use ONLY with Manco/Comet Industries Symmetric 7/8" Wide kevlar torque converter belts. ONLY ONE LEFT IN STOCK: ORDER NOW! Comet 209151A. Comet Industries 40D (7.5” Dia.) Driven Clutch #209151A. 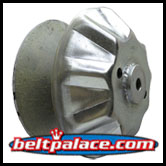 REPLACES: Manco 2432 Driven Clutch. Comet 209151A. Comet Industries 40D (7.5” Dia.) Driven Clutch #209151A. Specifications: Symmetric Belt System, 5/8” Bore, 7-1/2" Diameter, 3/16" keyway. REPLACES: Manco 2432 Driven Clutch, Comet/Hoffco 209151-A. Comet 209139A. Comet Industries 40/44 Series Driven Clutch. 7”/8” Bore. Comet 209139A. Comet Industries 40/44 Series Driven Clutch. 7”/8” Bore. 7-1/2” Diameter. Comet/American Sportworks-ASW/MANCO Part 209139-A. COMET DRIVEN G4 7/8" BORE SYMMETRIC - PART G4400.